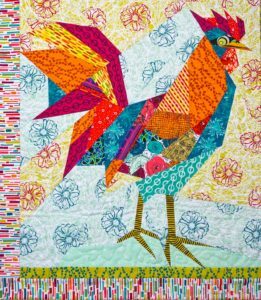 Reef Rooster meets Handmaker Fabrics! I was delighted this summer to meet Natalie Barnes during Quilters Affair in Sisters, Oregon. 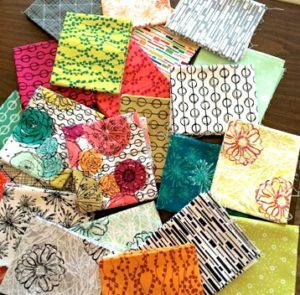 Natalie is a fabric designer for Windham Fabrics is introducing her new line of fabrics, Handmaker Fabrics with Windham Fabrics. Natalie kindly send me samples of her fabrics and asked me to create something. I was inspired by the colors in these great prints. So how could I resist? Natalie has a wonderful range of colors in this fabric line. Her vibrant colors pop!! I love the varying scale of her prints that work really well in my designs. A chicken seemed the perfect choice!! Meet Reef Rooster, sporting his Handmaker fabrics from Beyond the Reef. I love the varied background and bright tail feathers! What a fun project! !